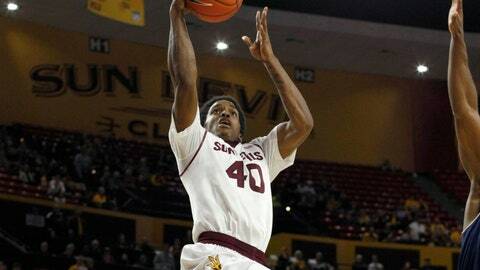 Shaquielle McKissic goes up for a layup for two of his team-leading 18 points in ASU's 74-61 win Saturday. TEMPE, Ariz. — UC Irvine and 7-foot-6 freshman Mamadou Ndiaye completed an abbreviated tour of the Pac-12 on Saturday afternoon at Wells Fargo Arena, where Arizona State showed the staying power necessary when conference play begins next week. Forward Shaquielle McKissic had 18 points to lead a balanced offense, and the Sun Devils pulled away in the final four minutes for a 72-61 victory over the Anteaters to finish nonconference play at 11-2, the same start they had a year ago. It was a group effort. Jahii Carson had 16 points, Jonathan Gilling had 13, Jermaine Marshall added 10 and Jordan Bachynski had nine points, 10 rebounds and six blocked shots while being matched against Ndiaye, a native of Senegal who had 12 points and 12 rebounds and showed some clever moves inside. "Truly a difference-maker," ASU coach Herb Sendek said of Ndiaye. By the end of the day, Irvine was in a unique position to evaluate parts of the Pac-12, which judging by both national rankings and head-to-head play appears to have taken another step forward this season. The preseason media choice to win the Big West, Irvine (7-7) is coached by former Pac-12 and Golden State Warriors assistant Russell Turner, who scheduled four Pac-12 teams on the road this season. The Anteaters beat Washington 86-72 when Ndiaye had a career-high 18 points on Nov. 14 but subsequently lost at California (73-56) and at No. 12 Oregon (91-63) before playing Arizona State. Irvine was within six points of the Sun Devils at 60-54 with four minutes remaining before Gilling hit a short baseline jumper and a 3-pointer from the left wing as part of a 9-2 run to provide an adequate cushion. Anteaters forward Will Davis II also had a double-double with 14 points and 10 rebounds. "I don’t think it was (Arizona State’s) best game because of some of the things we did, but they were good," said Turner, who was a Stanford assistant under Mike Montgomery from 2000-04, when the Cardinals twice won the Pac-10 and twice reached No. 1 in the AP poll. This (Arizona State) is a good basketball team, I know that. Their guards make them really good. "I’m not an expert on the Pac-12," Turner said, although he did have some general thoughts. "There are good teams there. I know the three that drilled us are good. This (Arizona State) is a good basketball team, I know that. Their guards make them really good. Bachynski is a quality shot-blocker who has an impact in a lot of ways. They have other good pieces around those guys. McKissic, give him credit. He is not a guy we figured would score 18 points on us, so for him to have that type of game is hard for us to overcome." McKissic was especially impactful in the second half, when he scored 15 points and made 5 of 6 field-goal attempts, including both of his 3-pointers. He also defended Irvine point guard Alex Young for stretches of the second half, and he forced a bad pass that Gilling stole and returned to McKissic for a three-point play and a 68-56 lead with 1:40 remaining. McKissic, who made his third straight start after moving back into the starting lineup, had four rebounds, three assists, two steals and no turnovers. Remarkably, he has 27 assists and two turnovers in 267 minutes this season. ASU won despite 2-of-10 shooting from Marshall and 4-of-11 shooting from Carson, who had no assists and five turnovers. Freshman Egor Koulechov added eight points, two rebounds and two assists off the bench. "That was the brightest part of the silver lining," Sendek said of the team-wide contributions. "Some other guys really played well. That’s basketball. That’s the nature of what we do. It changes from one media timeout to the next, let alone from one season to the next. So you just show up each day and you keep battling and keep grinding." At 7-foot-6, Mamadou Ndiaje is the tallest player in college basketball, according to UC Irvine. He is a native of Senegal who relocated to the U.S. in 2010 and played high school basketball at Brethren Christian High in Huntington Beach, Calif., a school of 250. — ASU made six 3-pointers, its second-lowest total of the season, but make sure Irvine could not counter from distance. The Anteaters, shooting 39 percent from three-point range in its first 13 games, was 4-of-17. — Jonathan Gilling plays like a point forward at times, and he had five more assists Saturday, giving him 46 this season, second on the team. His ability to make the extra pass on the perimeter often leads to better shots for teammates. — ASU had only two turnovers in the first half and finished with a 15 assists and 11 turnovers. The Sun Devils have had more turnovers than assists in only one game this season, a loss to Creighton when they had 11 assists and 13 turnovers. Suns general manager Ryan McDonough had a courtside seat for the game, getting a good look at Jahii Carson, Jordan Bachynski, Jermaine Marshall … and Mamadou Ndiaye. As the new year commences, isn’t McDonough in the running for NBA GM of the year? The Suns’ Jeff Hornacek certainly is among the candidates for coach of the year for what he has done with his group.